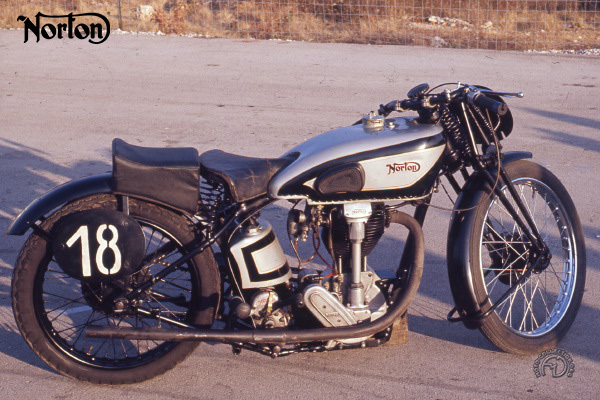 In 1931, the Norton team, headed by Stanley Woods and made up of Tim Hunt, Jimmie Simpson and Jimmy Guthrie, dominated the European GP scene, with first- and second place victories in the 350 and 500cc classes in the Isle of Man and Dutch TTs and the Belgian, Swiss and Ulster GPs - plus, for good measure, 500cc victories in the French and German GPs. In late 1931, to make the most of its racing success, a road-equipped sports replica was unveiled at the London Show. Named Norton International to emphasize the fact that it was derived from the marque's racing models, this novelty was available as the 350cc Model 40 and 500cc Model 30. The British magazine Motor Cycle headlined the fact that these "really are genuine replicas of the Nortons raced during the year." The classic lines of the International never lost their appeal. The engine, designed by Arthur Carroll, the design office chief, in collaboration with Joe Craig to replace the CS1 (created by Walter Moore in 1927), was mounted very low - just 3.5 inches ground clearance- and the transmission was a classic Sturmey-Archer. The finishing touch was a superb two-gallon fuel tank with crimped edges, painted in Norton's traditional silver-and-black finish with red pinstripes. The International remained in the catalogue until the mid-1950s, and its racing version, which later spawned the Manx, was the mainstay of the entry lists in 350 and 500cc racing for many years. The Norton International is one of the most outstanding sports bikes of all time. This actual bike was the first International exported to Belgium, in 1932.